Colours can change: they can transform; they can become brighter or darker, or move closer to white (bianco) or black (nero). They can become more transparent or reflective, tending towards «trasparenza» (T) or «specularita» (S). The purpose of the Italian CMN-86 colour system, dating from 1986, was to make a visual record of how and why colours (colori, C) appear, change and disappear. 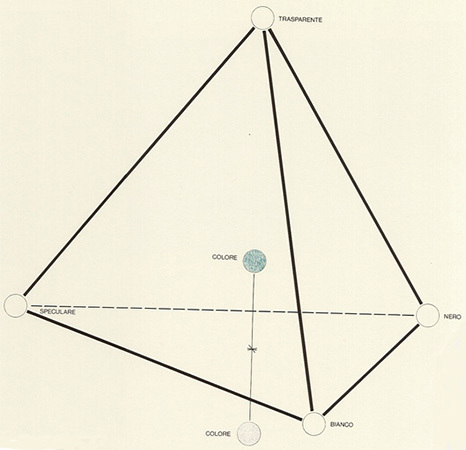 The basis for the construction is a tetrahedron, which we already know from plate 1 as part of the geometry of Plato’s ideas on colour. We have thus come full-circle through our selected colour-systems. 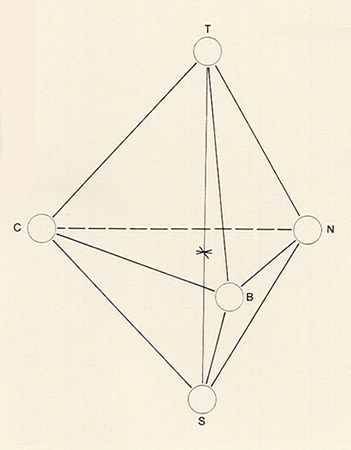 The single tetrahedron can be combined with others, in order to clear the way for the complete range of spacial models required not only to express the origins of all colours, but also reflect the intentions of the observer. Indeed, although transparency and reflection stem from illuminated objects, the actual colours seen will always be the result of the contribution made by the observer. With this system, the attempt has been made to give substance to that distant and rather obscure word «colori», which from its etymological root can be taken to mean «something disguised and revealed». Something is extracted from white light, thus enabling us to see more clearly the object on which it falls. To make our world more accessible, we ourselves construct a reality filled with colour. Ultimately, we create a profusion of colour-systems in order to gain more direct access to the world of colours. We arrange colours into systems so that we can understand their mixtures, master their diversity, illustrate their dimensions, understand the sensations they induce, or classify their differences. While many principles of order are possible, they all have one single history — and while history remains open, the systems themselves remain closed. 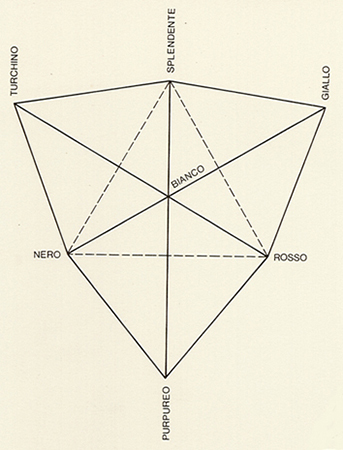 Date: The colour system was presented in Venice in 1986. Basic colours: The effect on colours of reflection and transparency is at the forefront of this system—a factor that is not considered by other colour-ordering systems. 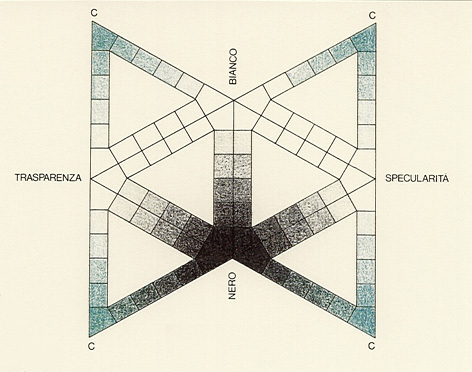 Bibliography: N. Silvestrini, «Sistema di Colori / Color Order Systems», Exhibition on the Biennale in Venice, 1986.